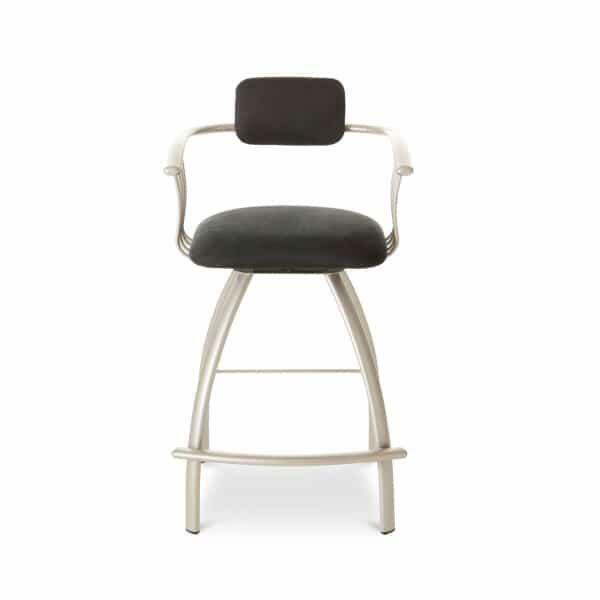 The Kris Bar Stool stands at the classic 30’’ bar seat height. It is made to fit with your existing bar height countertop or home bar. The Kris Bar Stool is fashioned with an ultra modern, contemporary styling, but whereas some of the Amisco modern stools are backless to enhance the minimalist feel, the Kris Bar Stool is equipped with all of the trappings of comfort that are ideal for day after day seating. The Kris stool features a footrest that wraps around the entirety of the base, which is especially helpful as the seat sits on a 360-degree swivel. The seat is covered in a plush cushion and covered with fabric. The stool features two armrests and a high backrest that is supportive and cushioned for added comfort. The frame is made with steel that is coated with a powder-baked finish. This layer adds protection against scratches. You choose the frame finish color and the cushion cover fabric. Dress it up with zany colors or bring it down to earth with subtle tones.